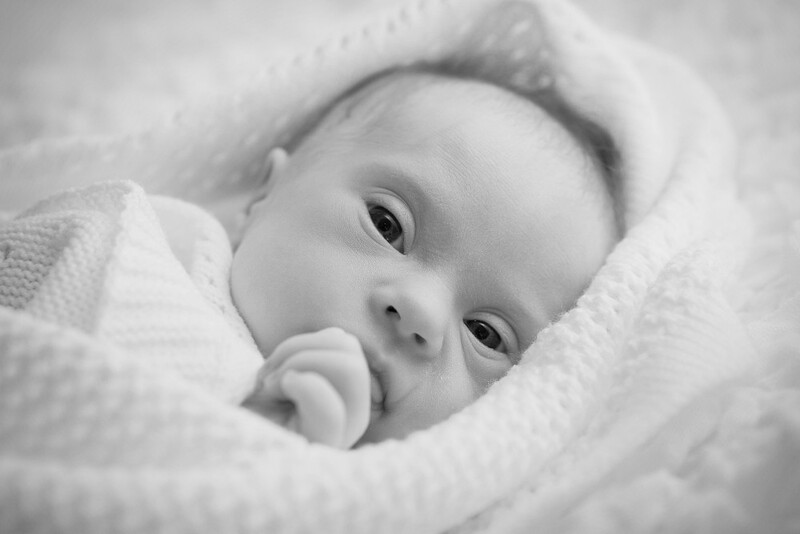 Preborn babies with Down syndrome are still aborted at alarming rates. Abortion advocates often use birth defects like Down syndrome as an excuse for late-term abortions, and the majority of women who receive a prenatal Down syndrome diagnosis still report that doctors deliver the news in an overwhelmingly negative manner. Many say that they felt pressured to have an abortion. Societally, it’s still expected that abortion will follow a Down syndrome diagnosis. 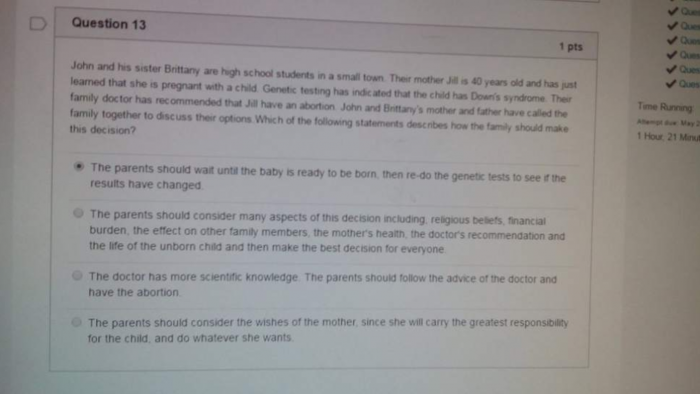 Salt Lake City’s Utah Electronic High School apparently not only feels that preborn babies with Down syndrome should be aborted, but also that high schoolers should be indoctrinated with that mindset as well. John and his sister Brittany are high school students in a small town. Their mother Jill is 40 years old and has just learned that she is pregnant with a child. Genetic testing has indicated that the child has Down’s syndrome. Their family doctor has recommended that Jill have an abortion. John and Brittany’s mother and father have called the family together to discuss their options. Which of the following statements describes how the family should make their decision? The parents should wait until the baby is ready to be born, then re-do the genetic tests to see if the results have changed. The parents should consider many aspects of this decision, including religious beliefs, financial burden, the effect on other family members, the mother’s health, the doctor’s recommendation and the life of the unborn child and then make the best decision for everyone. The doctor has more scientific knowledge. The parents should follow the advice of the doctor and have the abortion. The parents should consider the wishes of the mother, since she will carry the greatest responsibility for the child and do whatever she wants. I was taking my biology final today when I came across this question and I want to know what does this question have to do with biology? It came up a second time later on in the final and I saw it earlier in the year when I was taking a different test. The fist (sic) time I saw it they told me the answer was the parents should consider many aspects in the decision so I tried to answer differently on the final for both times it came up but I didn’t get to see the answer. So I ask again what does this have to do with biology?? The question was asked a total of three times, first in a quiz, and then twice during the final exam. Principal Kathleen Webb acknowledged that the question was inappropriate, and said that neither she nor the teacher knew how the test had found its way into the biology exams. It has now allegedly been removed. And the question might not just be inappropriate — it might be illegal. Utah law forbids schools from testing students on their religious or political beliefs without receiving parental consent first. Aside from the inappropriate and possibly illegal nature of the question, everything in it is deeply disturbing. The preborn child with Down syndrome is made to seem like he or she will be a burden on the family, financially and on the family members themselves. And most notably, nowhere does it give students the option to choose life for the preborn baby. 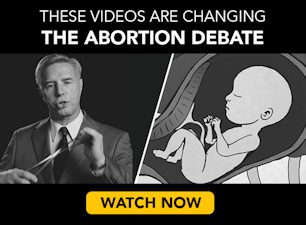 The only option is apparently abortion. The sad thing is, in addition to the horrific pro-abortion agenda being pushed onto high school students, it furthers damaging stereotypes of people with Down syndrome. They’re not burdens on their family, financially or otherwise. People with Down syndrome are able to go to school, get an education, and work just like any other person. Multiple studies have also found that people with Down syndrome aren’t emotional burdens on their families, either. To the contrary, parents of people with Down syndrome overwhelmingly say they are happier and more fulfilled because of their children with Down syndrome; siblings say that their brothers or sisters with Down syndrome have made them better people. And almost all people with Down syndrome say that they are happy with themselves and with their lives. Aborting a baby with Down syndrome is not best for anyone, and especially not for the baby, which makes the test option of “do what’s best for everyone” even more laughable. It’s good that this question has been removed from the school’s test banks, but there should be an investigation into how this was placed into any test to begin with. They also need to issue a public apology and maybe should consider getting involved with a Down syndrome advocacy group, because this little stunt of theirs has done irreparable harm to the Down syndrome community. It’s bad enough to advocate for the abortion of preborn babies with Down syndrome, but what they did is even worse than that: it was recommended to young people, impressionable teenagers, who were in essence being told that people with Down syndrome are burdens who don’t deserve to live. That goes far beyond inappropriate testing material, and deserves a much more in-depth response.